Is a four hour car journey worth it? Well actually it is! My husband, seven year old daughter and I recently had the privilege of spending time at Huntsham Court in Devon for a ‘Family’ themed weekend. After a long drive from our home in Kent, we drove up the narrow, winding lane that led us to Huntsham Court. We could have been forgiven in thinking that this was going to be a conventional Victorian country house complete with draughty corners and formal atmosphere. On the contrary, once inside it was apparent that this was not going to be any normal weekend away. The house oozed charm and warmth and had the ambiance of a much loved home. Sitting amongst acres of beautiful Devonshire countryside this handsome Grade2* Victorian Gothic house was bought by Damian Llambias and Christopher Badham 2 years ago and has been lovingly restored into a wonderful weekend retreat and a perfect venue for Corporate parties, Weddings and those ‘Special’ birthdays. Huntsham accommodates up to eighty guests with uniquely decorated bedrooms are individually named after Damian and Christopher’s family, friends and much loved dogs! 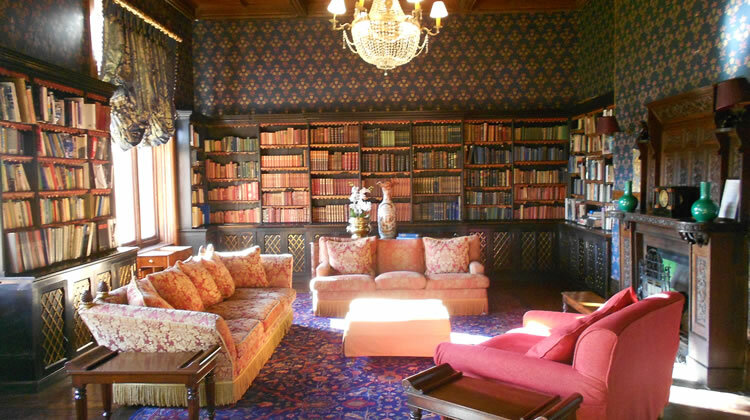 Our room -Beryl’s Boudoir- was approached via a handsome baronial staircase. The room was extremely spacious with an imposing mahogany carved four- poster bed, generous en-suite with roll-top bath and large travertine tiled shower, unfortunately not a power shower, but in the grand scheme a things a small hiccup in what was a lovely bedroom and an altogether unique and personal experience. As we had requested, a bed was made up in our room for our young daughter but, should it be more convenient for guests, the house does have several inter-connecting rooms. Every room in the house is individually and creatively decorated – from Chinoiserie clad walls, to open brickwork, all generously complimented by sumptuous soft furnishings and aged wooden floor boards. Dinner was provided by a local caterer and was a very relaxed affair. A buffet had been prepared to include an array of local produce of cured meats, artisan breads and wonderful, fresh herby salads. We were comfortably seated in the baronial style dining room and although a formal setting, the owners – once again – managed to achieve a very casual, homely feel. The added bonus being that once the children had finished their meal they could visit the TV room, aptly known as ‘The Den’ or the library where a pool table had been set up, leaving parents to enjoy their meal with a few glasses of wine amongst friends. The following day, we were treated to a beauty treatment by a local Therapist who came to the house, whilst the children enjoyed a Falconry Display and a spot of supervised archery. In the evening yet another exceptional dinner was prepared by one of the many local caterers that the owners recommend. Great thought had been put into the after dinner entertainment; a casino had been set up in one of the five reception rooms for all to enjoy. This proved a real hit with some of the more competitive in our party! Throughout the weekend all guests had complete freedom of the house, offering a real ‘home from home’ experience with all the modern luxuries that we have come to expect from a 5* Country Hotel. Very rarely have I stayed in such beautiful surroundings with such ease whilst trying to keep my daughter ‘in check’.The children seemed to fit right in, the house was big enough for them to play quite happily whether it was a game of hide & seek or just watching a DVD with copious amounts of popcorn supplied by the well stocked kitchen. This allowed the adults to enjoy a drink at the bar – watch rugby – if so inclined – have a leisurely walk in the sprawling grounds, and totally relax, with no pressure from the children. Damian and Chris provide a truly hands-on, personal and caring feeling to this incredible venue. The attention to detail, the relaxed atmosphere, superb local cuisine and stunning surroundings make it impossible not to recommend another visit. Quite simply Huntsham Court is not trying to be a hotel, or a B&B, but just a home from home which can be tailored to suit individual needs for Corporate days, Private Gatherings or, indeed, any social occasion.